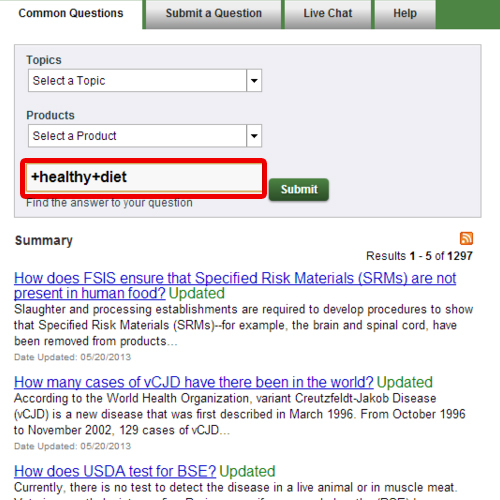 In this tutorial, we will teach you how to ask Food Safety Questions online. We will visit the ask Karen page for food safety education. We will teach you how to ask questions about food safety online. 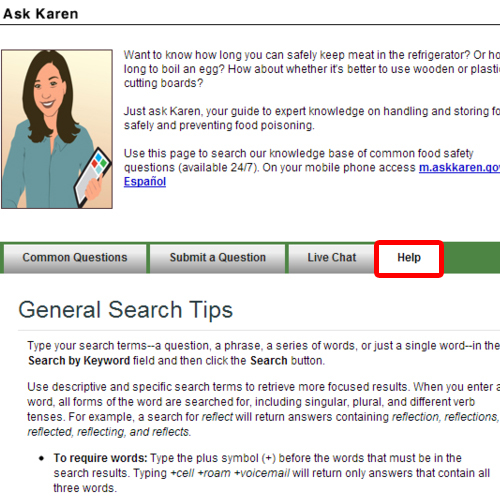 Follow this step by step guide to learn how to ask Food Safety Questions online. First of all, open any web browser and go to fsis.usda.gov. 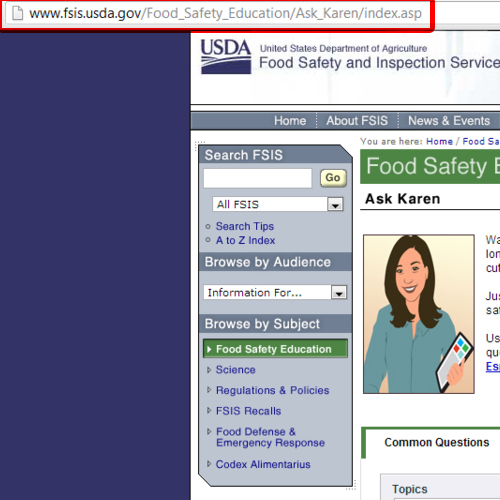 Go to the ask Karen page under the Food Safety Education section. Once the page loads, go to the help tab available. Over here, you can read the general search tips that will help you search. We will pick a tip or two from here. These tips will come in handy when we are going to search for common questions. Now click on the common questions tab and over here you can search for questions that have been frequently asked in the past. Type the phrase or the question that you want to ask in the search bar and click on the submit button. We picked up a searching tip from the help tab; add the plus (+) symbol before the words that must be in the search results. You will be presented with all the relevant search results that best meet your search criteria. You can always browse for common questions by topic and products. Using these filters will help you narrow down your search. If you want to ask a question, click on the “submit a question” tab. Over here, type the question that you want to ask in the text box available at the bottom. Once you are done, enter your email address which is necessary. Also choose the topic to which your question belongs. 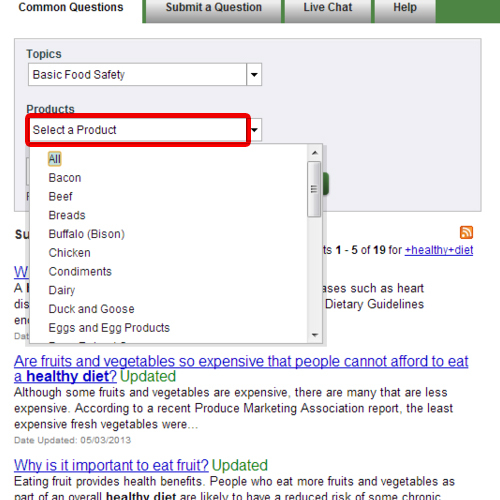 For the purpose of this tutorial, we will choose basic food safety topic and click on the submit button. We will be displayed an error and will be asked to choose an item under this broad topic. Once done, click on the submit button in order to post a question. 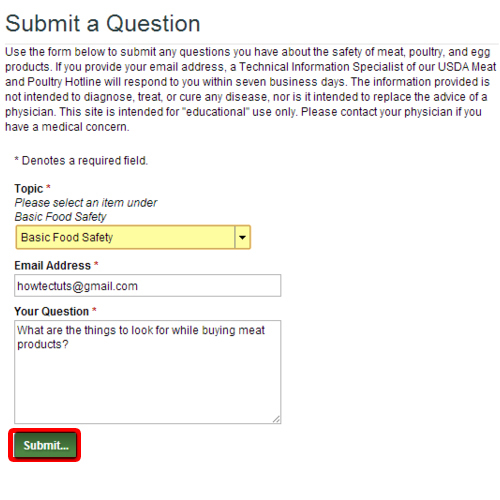 In this manner, you can ask a food safety question.